I'm very excited to share my new job board, which is now part of the Simply Hired network. The Ancient Digger Job board will feature an array of job categories. 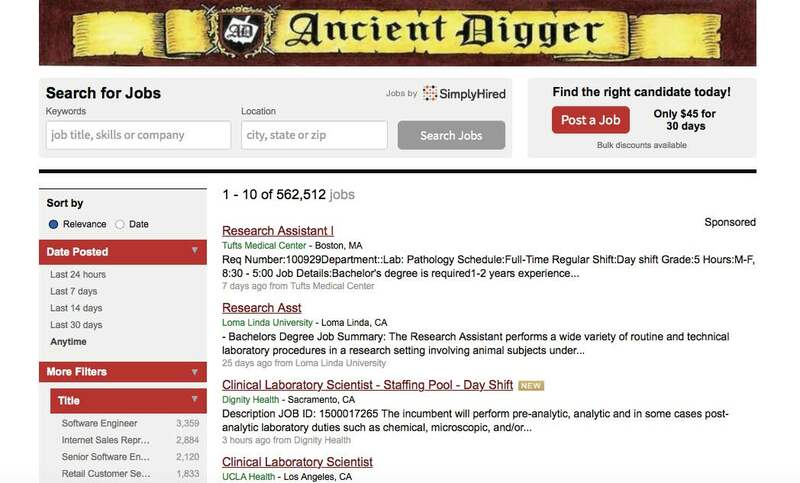 Just search using the keyword feature for archaeology jobs, or any other particular field of interest to you. You can also utilize "more filters" to narrow down your search to title, company, job type, education, and experience level. Reach the targeted audience of Ancient Digger and Simply Hired. Your ad will be displayed to qualified candidates alongside relevant content, and its reach will include those visitors of Ancient Digger, and the millions of applicants searching for jobs on Simply Hired. Reach the targeted audience of Ancient Digger. Your ad will still be displayed to qualified candidates alongside relevant content, but its reach will be limited to just Ancient Digger.